Sir William Keyt (1668-1741), the 3rd Baronet was married to Hon. Anne nee Tracy. He was a Member of Parliament for Warwick between 1722 - 1735. Keyt subsequently left his wife in London to live with her maid on his Cotswold estate, where he spent much of his fortune on extravagant building projects in extending and improving his mansion. When his mistress, viewing his house, asked ‘what is a kite without wings’, he added two large side extensions to it. He had completed the elegant estate at Norton House in Upper Norton near Chipping Campden and Mickleton in the north of the Cotswolds. Deserted by his mistress, he took to the bottle and gambling. Setting fire to his house after a prolonged drinking bout in September 1741, he perished in the flames, resisting attempts to rescue him. On the morning of the day on which he executed his fatal resolution, Keyt sent for his son, and for his new mistress; with what intention can only be conjectured: but luckily neither of them obeyed the summons. Early in the evening in the month of October, the butler had lighted two candles, as usual, and set them upon the marble table in the hall. Keyt came down, and took them up himself, as he frequently did. After some time, however, one of the House-maids ran down stairs in a great fright, and said, 'the lobby was all in a cloud of smoke.' The servants, and a Tradesman that was in the house on business, ran immediately up, and, forcing open the door from where the smoke seemed to come, they found Keyt had set fire to a large heap of fine linen (piled up in the middle of the room), which had been given by some old Lady, a relation, as a legacy to his eldest son. Whilst the attention of the servants was entirely taken up with extinguishing the flames in the room, Keyt had made his escape into an adjoining chamber, where there was a cotton bed, which was wainscoted with deal, as most finished rooms then were. When they broke open the door, the flames burst out on them with such fury, that they were all glad to make their escape out of the house; the principal part of which was in a few hours burnt to the ground; and no other remains of Keyt were found the next morning, other than his hip-bone, and the vertebrae, or bones of the back; with two or three keys, and a gold watch, which he had in his pocket. It is said that one of Keyt's servants, Thomas Whitstone, did rush into the burning room and held Sir William in his arms and would have saved him but this was not permitted.
" after squandering away an ample fortune, in a moment of hopeless perplexity he set fire to his splendid mansion on the Cotswold hills and was him-self burnt to ashes with the building"
His son, Sir Thomas Charles Keyt, inherited crippling debts and had to remorgage several properties to raise sufficient money to pay off his father's debts. The estate, after the fire, was renamed from Upper Norton to Burnt Norton. 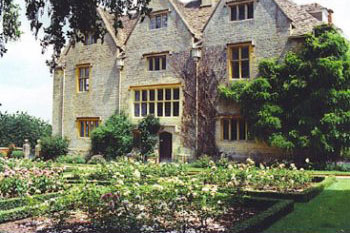 In 1934 the poet Thomas Stearns Eliot (the most important English-language poet of the 20th century and Nobel Laureate ) visited his old college girlfriend Emily Hale in the Cotswold town of Chipping Campden, herself a guest of American friends, the Perkins family, several times a year between 1934 and 1938 (except for 1936). It was on a late summer day in September 1934 when, out on his latest country walk with Emily Hale - they had ventured off the road, walked through the woods and found themselves in the upper garden of the estate of a manor house at Burnt Norton. The current owners hadn't invited them, they just arrived. No-one knows how long he and Emily stayed. That they were there at all is barely suggested by Eliot's famous poem - Four Quartets - Burnt Norton being the first, whose lines could reflect the Ghosts of the past and the tragedy that occured. 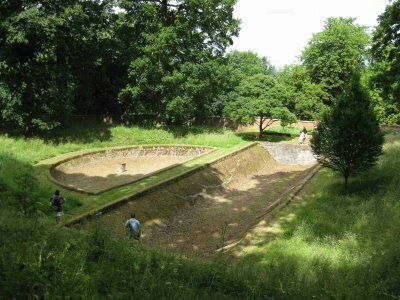 They both explored Burnt Norton's mysterious and semi-wild garden. wandering in and out of the rose garden, he must have noticed the giant Acer pseudoplatanus variegatum, a variegated sycamore with 'light upon the figured leaf'. It must be wondered what T. S. Eliot might have written had he been aware of the passion and fury played out in 1741.